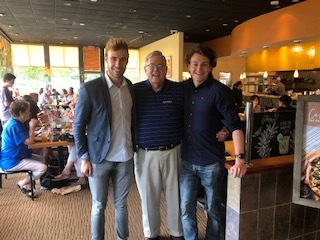 With blessings from their business professsor, Koen Nijland and Kervin Krommendijk flew from Amsterdam to Los Angeles April 20, 2018, and connected with colleague Mike Crimshaw, Ex Dir of the Entrepreneurial Institute, College of Business at Cal State Dominguez Hills to research American entrepreneurs. “Mr. Grimshaw made sure that we got plugged into all levels of communities in LA to get a full on experience of America. He made sure we went to a political event, venturing summit, Disneyland, improv training at a Goodwill store, lots of incubator and accelerator programs, local restaurants and even some lectures at the university.” As an active participant in Enactus, Mike has readily responded to an email for assistance. 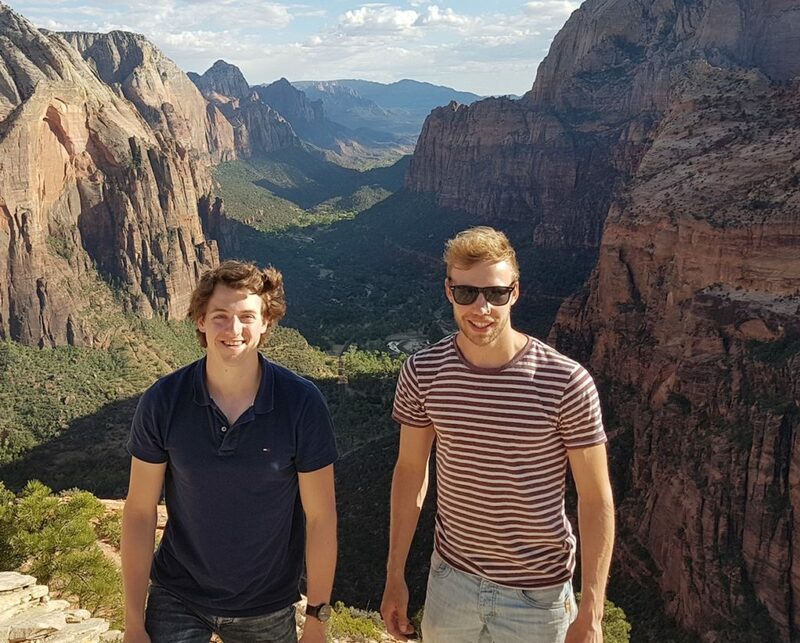 Their purpose is to survey American entrepreneurs “to find out what drives them to start a business and what drives their success.” Koen is focused on the ecosystem culture, innovation, and applying Saras Sarasvathy’s Effectuation to startups. Kervin, on the other hand, is interested in the cognitive knowledge, the passion of U. S. entrepreneurs; cognitive knowledge refers to one’s conscious understanding of matters as they relate to people, tasks, and strategy. What’s so extraordinary is the creativity these two sons of the Netherlands have used to put this summer tour together. First and foremost, it is digital. They use the internet for information on companies, contacts, and data. They use a cell phone for geographic (GPS) movement, Uber for transportation (as well as public plus a rare car rental), and AirBnB for housing. All food is cooked in rooms to keep within a tight budget, and most plans are adjusted (if you will “iterated”) on the fly. In their own words from their diary, “at the innovation incubator at Cal State DH we met terrific social start-ups worth mentioning. Jason from Closedeyesopenheart has a start-up that focuses on solving the problem of homeless in LA. This cause that really caught our eye because we noticed what a serious problem it is in the city. During one meeting, we had the opportunity to gain insight into the challenges a startup entrepreneur encounters. One issue was building the network required to collect needed resources. We compared the problem to our first weeks in America; we had no network and had to grow our connections to contact entrepreneurs. At new venture summit of the University of Southern California we glimpsed a different kind of start-up. Docbot, an innovation driven start-up, is a good example of a company that offers a strong solution to the real life problem, health care quality. Their goal is to become a leading provider of real-time artificial intelligence for medical procedures such as colonoscopies when immediate feedback improves patient outcomes. We also noticed much bigger firms asked for a least half a million in funding and seemed to have a working product with a proven value. Another stand-out observation is the development of a start-up pitch by entrepreneurs. We saw some pitch perfect, two minute talks at the venturing summit, and then contrasted them with a million cups event. The latter are in an earlier stage of development and still working toward key aspects of their business to pitch. A typicial meeting had two separate entrepreneurs pitch their start-up “ask”. An entrepreneur asks the audience of entrepreneurs for feedback about a specific part of their business and pitch. One of the most remarkeable things that we’ve experienced in America is a fantastic entrepreneurial community where everybody tries to help each other. Events like the “Get Started Orange County” is a good example of a competition that is also an opportunity for entrepreneurs to grow their network. The winner of this competition was an impressive, energetic woman who discovered a material to make earthquake resistent buildings accessible to everyone saving tons of money (called METAseismic). Koen and Kervin have written a survey to determine if a person is wired to be an entrepreneur. Everyone is encouraged to connect with them on Linked In at https://www.linkedin.com/in/koen-nijland-3b67a968/ or https://www.linkedin.com/in/kervin-krommendijk-323268162/ and take the survey. The first 50 respondents are eligible to win a $50 Amazon gift card. After the end of the trip (Boston), Koen and Kervin will compose a report about factors that drive entrepreneurship and entrepreneurship success in the U. S. Koen will explain how cultural influences and innovation impact new ventures while Kervin investigates how passion and cognitive style drive success. Your editor and many others from entrepreneurship have been enriched and enjoyed meeting these special, young men from Holland. These guys ‘Van een vlieg een olifant maken’ (made an elephant out of a fly). Small Business Loses Big Time with Demise of Net Neutrality.